When you think about it, almost all our energy sources are at their root a product of solar energy from the sun. The sun heats the earth and causes wind and water currents. The sun evaporates water which then falls upland and produces the potential energy that is converted to mechanical energy when it 'falls' over the waterwheels of old or the modern turbines of today. In a delayed sense, coal and oil are stored forms of solar energy: ancient forests captured the energy of the sun and lay untapped until coal mines and power plants unleash the energy today. But in all these cases, the energy processes described above have intermediate steps before we can tap the energy. But now we are armed with modern electronic and materials technologies that make direct access to solar energy possible and, most importantly, economically profitable. 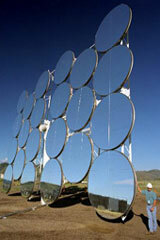 The government is taking steps, together with solar energy firms, to produce large solar farms. But at the micro-level, consumers and businesses can help us make the shift. Solar panels on roof tops, solar heated water tanks, or solar panels in the backyard.... each of these can help make a difference.